I have stared at Matthew's photo for quite awhile and I can't figure out if he has extra large nostrils or two marks on his nose. Either way it cracks me up and how cute would it be to see him peering up at you around your house? 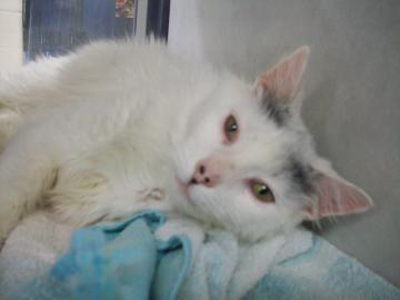 Matthew is a 4-year-old male cat who was brought to Lollypop Farm with six other cats because his owner felt that she could not for them all. He is a playful cat—he likes mouse toys—and has a cute meow. Matthew has lived with cats, dogs, and children before, and he did well with every one! He loves being around people and getting attention, and he would make a wonderful companion.